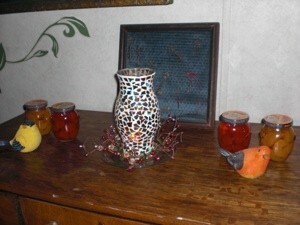 These pretty little jars-o-fruit were found in the dollar aisle at the store of a nearby town. First seeing them, they appeared to be cute little candles but when picked up, the fluid inside was visible. Perfect little beautiful jars of fruit. All the product info is on the lid. No labels. So as you can see they serve a double duty as a decoration and my son will delight in them. They contain (red) strawberries in syrup and yellow/gold mandarin orange slices, 2 of his favorites!